The former is a little concerning seeing as the ptfe has seen only a couple hundred hours of printing. As far as assembly, I heated the nozzle up and tightened it down as hard as I could without snapping the brass tube - the last thing I want is a chunk of the throat sheared off and seized in the block! I would appreciate advice from @amedee! Hey all, I have recently been having some extrusion issues with my UMO+ and upon completing some atomic pulls noticed some issues right away. I figured it might be interesting to try to diagnose the hotend via atomic pulls as this is something I have not seen anyone do. In the first image you can see a nice atomic pull tip in the exact shape of the nozzle followed by a necked region. The necked region has a "collar" in the center which I believe corresponds to where the nozzle and throat meet inside the heater block. I do not think this would be causing any clogs as there is no foreign material present in here and I have not had any filament leaking from the heater block. Next you see another necked region as you move to the top of the throat. Here you can see a large lateral jog in the filament which should be happening where the PEEK meets the throat (aka the transition zone, temperature wise). 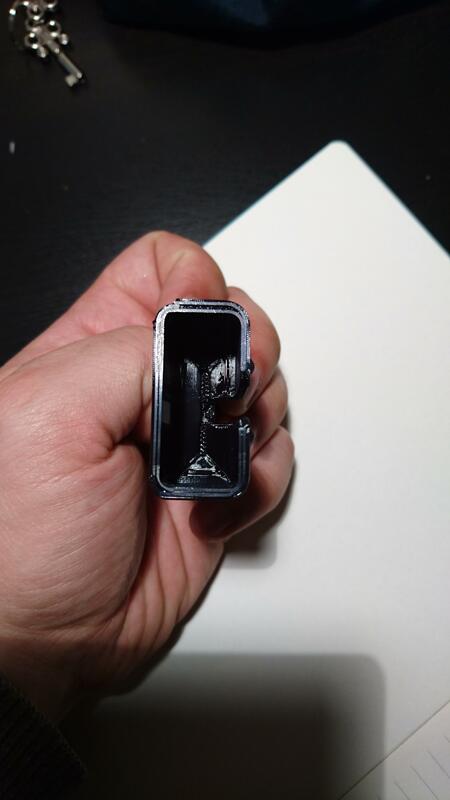 This is where I could use some help: I have taken my hotend apart and the throat threads quite nicely into the PEEK. I have even replaced the throat with one I got from robotdigg and the issue persists in the exact same shape. This indicates to me that this has to be happening where the PTFE coupler meets the PEEK insulator, however there should not be any molten filament in this area as far as I know. I have ordered replacement PEEK and PTFE parts so it will be relatively straightforward to troubleshoot when they come in. Let me know if you have any ideas for further testing and if this helps you in any way. Go ahead and post some images of your atomic pulls for analysis if you're interested! Oops, I actually have solved the issue. When I first got the printer I found that one of my 8mm Y shafts had about half a mm of play axially which I had fixed using an endcap with a nylon screw. This nylon screw wore down from friction without me realizing and the play came back. Interestingly, the inertia from print moves was not enough to shift the rod, however travel moves did hence the consistency (always start of a new layer, right after a large travel move). Thanks! Hi all, I am having an issue where my prints have a massive outer wall misalignment at or around the z-seam. The outer wall where a new layer begins is laid down about one layer further back than it should lie. The issue is best seen in the following images: (Here I stick a full hair clip into the misalignment!) I am getting this issue persistently regardless of my infill percentage and other settings. I thought this was related to coasting but I have since disabled the feature with no change. I am using the default Cura settings to slice my model. This seems to me to be a software issue because it is very consistent. I have had full build plates of 5 different models all showing the same artifact only on the backmost face regardless of the geometry. Thanks for your help! Just a quick update regarding prints before the GT2 upgrade. Below you can see a new, very strange artifact. I have been consistantly getting it since switching back to PLA and realigning my x/y axis. What you can see below is that the outer wall of my prints is shifting outwards by one full row for some reason. What isn't shown is that this print is one of roughly 5 parts on a very full buildplate and all of the parts had this exact same issue ONLY on their backmost face. This misalignment of the outer wall is so severe that I managed to fit an entire hair clip into the space! Not only that, but the surface finish on the vertical portion of that wall is flawless. I am at a loss for what is wrong here, but it certainly feels like it's on the software side of things. The only new thing I have done with Cura since the switch to PLA is enable coasting. Well I can't see any wobble by eye or in a video, but it could be there and my eyes are just bad. One thing I noticed while measuring spacers is that my right side pulleys are about 4mm closer to the frame than they should be. After the spacers and slider blocks are printed (I need to size the blocks up ~3%, I was impatient and printed all 4 so it serves me right) I'll be taking the xy axis apart in any case so I'll check how straight the rods are then. I did notice that one of the y blocks has a tiny bit of play along the axis of the rod but with properly sized spacers and the tighter gt2 belts that should go away. Thanks for your help and I'll post updates after the upgrade is done! Haha, I just got my order from robotdigg actually, the lars ultralight blocks are currently being printed This is concerning though, should I ream the bearing mounts out to be straight and fit a spacer around the bearing? Should I try to RMA the frame? The misalignment could be forcing the 8mm rods to bend into place which could explain the slight binding I feel in Y. Thanks! I have been squaring the assembly pretty rigorously with the supplied calibration tool, but upon closer inspection it seems like the laser cuts were at a slight angle such that the tool is about 5 degrees off perpendicular to the smooth rods. I guess I need to print new tools, square, print more accurate tools, square, etc? Hello all, I have recently noticed that I have an x/y shift in planes where there is a feature. Look below for an image. This issue only occurs on the front and right sides of my prints and is a pretty significany shift! I have tightened my pullys as far as they can go and I am not seeing any slippage. I'm printing at 55mm/s with 1500 m/s2 acceleration and 15 (whatever Cura's interpretation of jerk is) at various layer heights. I have tried slowing and speeding my prints up and I still have this artifact. This piece was printed at an angle to minimize support blemishes, meaning that the artifacts you see ran parallel to the build plate. Thank you! One thing to note is that if you use spiralize, your top layer quality will decrease significantly. This is because you are setting your Z height to be changing constantly rather than having discrete steps. There's a setting in Cura under Shell called "Z Seam Alignment". The default setting is "back" which gives the one seam, and you can change it to random but I will warn you that it reduces the surface quality of the print as you get small "hairs" in some weird places on each layer. I personally like back because it makes finishing easier. Hello all, I recently tried to print some taller items using my Ultimaker Original Plus and I have consistently been seeing a very small (but very annoying!) layer shift roughly 2cm into my print. I have tried tightening down all of my pulleys and squared the entire machine numerous times but this issue persists. I have attached some images below and was wondering if anybody could help me diagnose this issue. Thanks!